Our Nature-based designs strive to take inspiration from Nature’s design language and use them in artistic ways to create places of adventure, engagement and exploration. The design and construction process is centred on the predominant use of local natural materials, handcrafted and finished to create an alluring and adventurous Nature Space that reflects the structure and beauty of nature. Each project is created from a unique response to the local community sense of place, people, culture, ecology, and stories, whilst being founded on recognised Nature Based design. At NBP we strive to continually integrate local design ideas with well researched innovative Nature Based design, to provide the very best Nature Based Playgrounds and outcomes for the local community. Each Nature Play project is an artistically constructed environment consisting of various unique experiential play and learning spaces, within which each element is carefully placed. Such environments engage and invite children to play, manipulate, explore and imagine while demonstrating some of the ecological values and processes of that specific place. At Nature Based Play we believe in providing quality accessible Nature Based Spaces for kids to experience and enjoy, and increasing positive developmental outcomes for all children. Importantly Nature-Based Playgrounds and Parks serve an educational role through their use of locally available natural materials and native flora to enhance the story of ‘place’. Nature Play and Outdoor Learning is a pioneering movement, with hugely positive benefits to kids, schools and communities. These outcomes have been well documented through research globally, highlighting the many different benefits to kids’ wellbeing and learning opportunities. 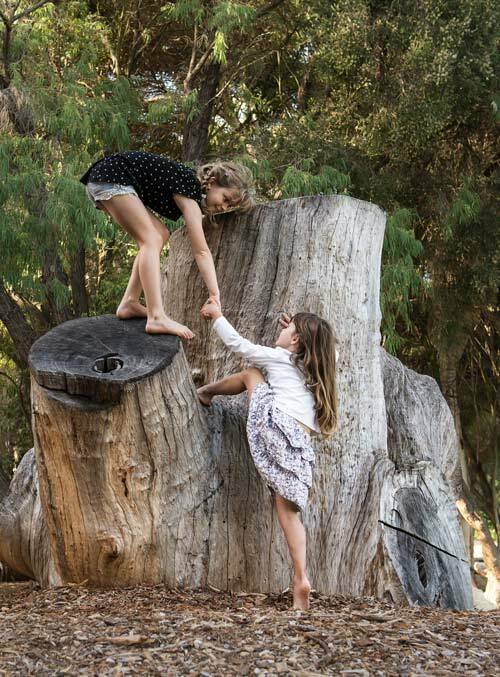 Nature Based Play is committed to ongoing research of Nature Play in Australia, and will be collaborating with recognised research teams to monitor and analyse benefits of the Nature Play Spaces we have constructed in schools and parks.